Mere moments after the user inputs their desired six-character world “seed” in order to carve out Songbringer‘s procedurally-generated world — once the opening cutscene of the titular space ship crash-landing on a seemingly alien planet, subsides — it’s made abundantly clear that the game is taking a hefty chunk of inspiration and influence from the original Legend of Zelda on the NES. And only that game. In both its design and its progression, the fact that the main character starts out in a fairly square plot of land, only to enter a nearby cave to discover and acquire a sword, you’d be forgiven for thinking all the game really needed to complete the facade was an old man warning you that “it’s dangerous to go alone”. Joking aside, there’s nothing inherently wrong with developers wearing their inspirations on their sleeve (albeit here, in a much more visible fashion). 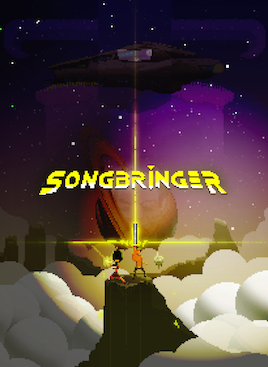 As we’ve seen with past titles like Axiom Verge with its clear throw-back to the atmosphere-laden World-building of Super Metroid or even upcoming games such as WarGroove — many citing it as the spiritual successor to the Advance Wars series of handheld, turn-based strategy titles — it’s clear from the off what kind of game Songbringer wants to look like and play like but the question more so, as players venture across its grid-based environment and trudge through its similarly-procedural dungeons becomes: but is it simply imitation? Obviously, there’s an undercurrent of contemporary, pixel-savvy visuals when it comes to Songbringer‘s binding aesthetic. A vibrant if still emotively-cold World filled with plenty of characters and hostiles alike, comprised of no more than a small number of pixels. Lesser still for the tinier of foes. Perhaps by way of a consequence, Wizard Fu’s just-as-clear hearkening to the illustrative art of 20th century sc-fi novels comes to the forefront in its distinct use of color palettes and more varied hues throughout its day-night cycle. Be this the yellow-green swathes during the day, the mystical blue-pink’s at night, even the odd mix iof darkened organic and artificial shades in its many dungeons. Though the environments themselves may come off restricted on shape and design, Wizard Fu’s careful use of matching colors, without going overboard, at the very least paints the World of Songbringer in that similarly pre-21st century awe of part-wonder but of course part-caution. Beyond its pretty colors and occasionally soothing backdrops, Songbringer is the kind of game that, despite its heart clearly being in the right place in hearkening to that mid-80s adventure game experience, ends up with its head far from a similar position. Part of the problem regarding Wizard Fu’s rose-tinted perception of exploration is the near-constant nagging one builds whilst playing is that something major or otherwise more crucial is being missed or ignored, through no fault of the player. While the game does make an effort to provide helpful information pertaining to potentially interesting objects in a certain part of the map or the recommended numbered order of dungeons, a lot of the time you can’t help but figuratively and of course literally squint your eyes at the screen and debate that Songbringer is itself lost in its own indulgent nostalgia. Aided in no way by its over-compromising on pixel art and as a result, already giving the player the undesired challenge just to make out what they’re seeing on screen. 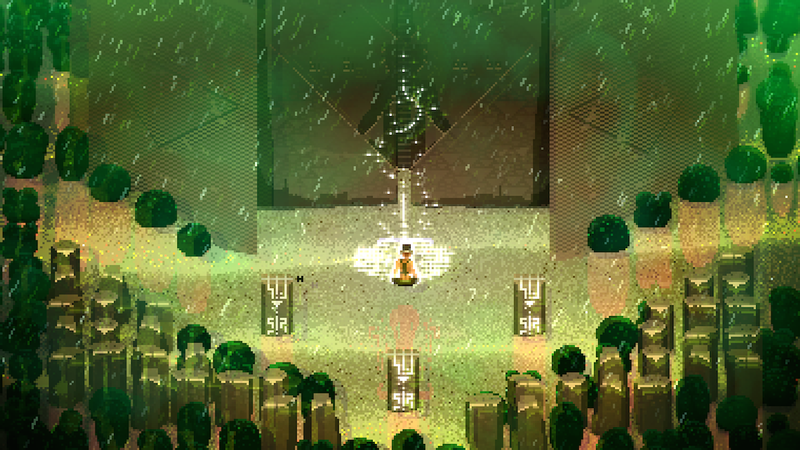 Songbringer does indeed try to prioritize challenge and learning one’s way over any sort of hand-holding or forcible direction, striking that fair balance a series like Metroid or indeed Zelda has architected via offering subtle suggestions to perhaps hunt down the right item/weapon or simply try an alternate route in order to gain another dungeon key. 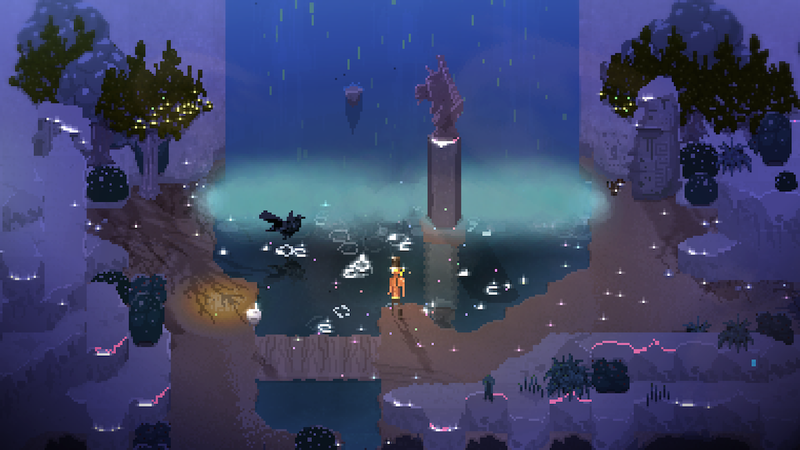 In that respect, Songbringer’s design during the less-frantic moments is a welcome sight and one players can easily get soaked into. Perhaps it’s a consequence of its procedural nature, but there comes a point when unknowingly stepping into a room full to the brim with foes, even with than five/six hearts worth of HP — only to die and subsequently return to the beginning of a dungeon to start over — loses any and all degree of pull when the challenge comes across less focused on balance and more on simply hurling a given task one after another without distinct purpose. Boss battles do eventually manage to strike that balance between raw challenge yet offering respite to learn from one’s previous tactics/mistakes, though the main combat in Songbringer leaves a lot to be desired. Especially when all can one do is simply spam the attack button until a foe is dismissed; additional items that the player can unlock or discover throughout do bolster one’s arsenal, but even then, whether it’s bombs, a boomerang-style hat one can toss or a teleportation trick that really doesn’t offer much by way of advantage, most of these acquisitions either feel overpowered, underpowered or generally forgettable in the long term without truly underscoring their purpose or usefulness. Meaning that for the most part, you’ll be stuck using the sword you acquired at the beginning to hopefully take down enemies. I say hopefully, because while there are no health bars to distinguish how far the more tougher enemies are from inevitable demise, the mechanical side to combat comes across as either sluggish or merely shallow to partake in. And this is before mentioning the seemingly random movement of some enemies — or the fact some can casually stroll through your sword swings without a care in the World — as well as how even your own movement can go against what exactly you’re inputting. Playing this with a controller on PC, don’t be surprised to find your character slide a diagonal direction away from where you were dictating more frequently than one would desire. Helped in no way by the similarly-pointless placement of certain environmental obstructions in the more tighter spots that do nothing but add further obstructive annoyance, especially when amidst the heat of a hefty one-versus-twenty encounter. There comes a point, sadly, despite its pretty pixels and its charming swathes of color that my desire to trudge through Songbringer only lessens and my wanting to return to the original Legend of Zelda grows by contrast. This despite Wizard Fu, solely on the structural design of its dungeons, managing to capture that simplified effectiveness that dungeon-crawling brings. 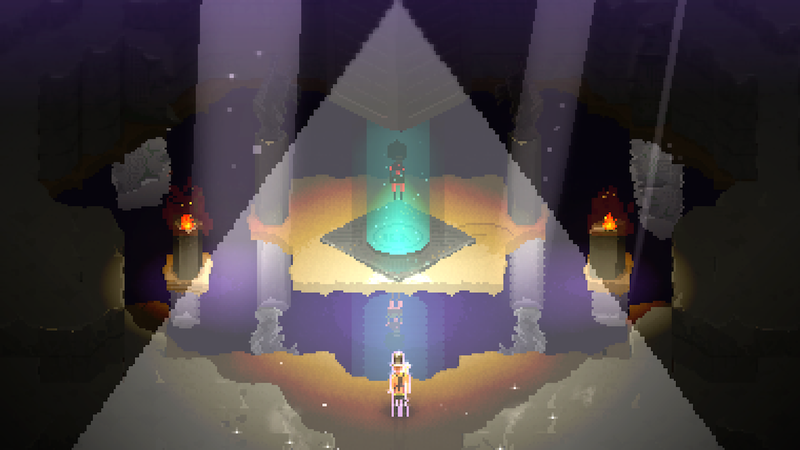 As such, though the backstory and plot to Songbringer aren’t quite as mystical or as curious as its visual aesthetic, when one needn’t struggle through the next perilous combat segment, there’s enough in the spacious isolation of its environments — both above and underground — to keep one’s self venturing on. If Wizard Fu set out to make the most faithful of homages to the original Legend of Zelda specifically, Songbringer fits the bill with its hands-off approach to exploration-driven adventure. Unfortunately what the game initially builds up with its environments and keen visual style is partially swept aside by some unruly technical aspects and the frustration of its simplistic, button-mashing combat that ultimately come to define a player’s all-around experience. Overall, while its procedurally-generated backbone delivers some interesting results so far as dungeon structure goes, there’s no getting away from the irk that Songbringer, partially, loses sight of some occasional instruction in favor of this romantic longing for past-gen wonder. To its credit, the mystery and intrigue is there…just not the patience.